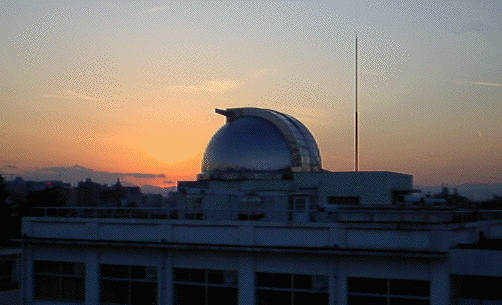 A 40cm Cassegrain Telescope is set on top of the First Building for Natural Sciences in Tokyo Gakugei University. The aperture size of Telescope is of 40cm. Other 10cm and 5cm small telescopes are attached to the 40cm Cassegrain telescope. With this 40cm telescope, we observe some variavle stars and try to detect of occultations caused of extra-planets system. We can observe some objects with ether CCD cameras or our own eye. 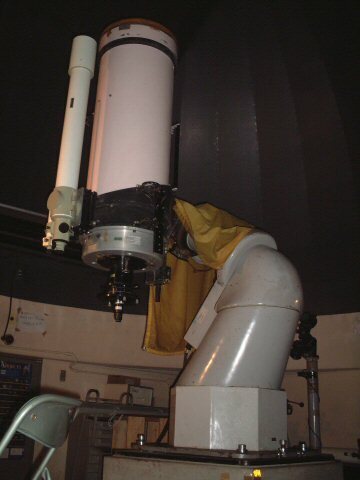 We have five 8cm refracting telescope in Astronomical Class. These are used in basic experiment for college students. They observe sunspots and distant things on the Earth. Our five 8cm refracting telescope have same performance. 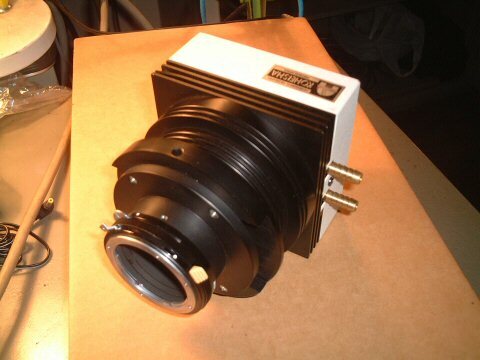 We have two cooled CCD cameras. They are attached to the 40cm Cassegrain telescope. We can carry out photometric observations with them. Obtained digitized data are analyzed with some computer applications. Some hardwares and softwares are developped in this laboratory. We carry out optical experiments in this room. We have development laboratories. We renewed a 60cm radio telescope (Very Small Telescope 1 = VST1) of the Institute of Astronomy (IoA), the University of Tokyo with IoA and with Osaka Prefecture University. The VST1 was set a millimeter radio telescope set in the Nobeyama radio Observatory (NRO), National Astronomical Observatory of Japan (NAOJ). The VST1 had been very small, but its high mobility enabled to wide servey observation. Our three university team improved spectrometer, receiver and softwares of the VST1. 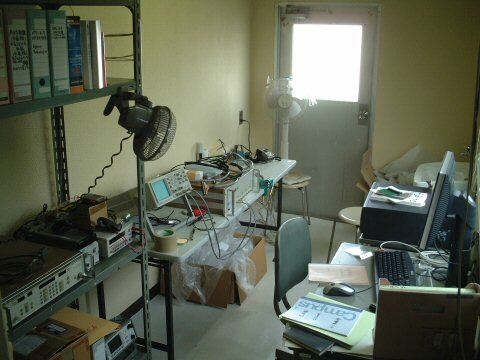 Tokyo Gakugei University team charged the improvement of spectrometer and some softwares. Instrumental first light was done in 2005 March 21. We also developed another 1.5m radio telescope with Osaka Prefecture University. 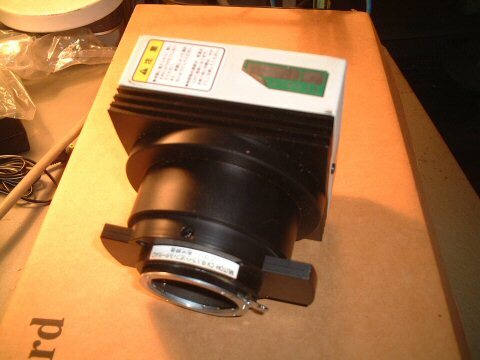 Tokyo Gakugei University team charged the development of spectrometer and some softwares. 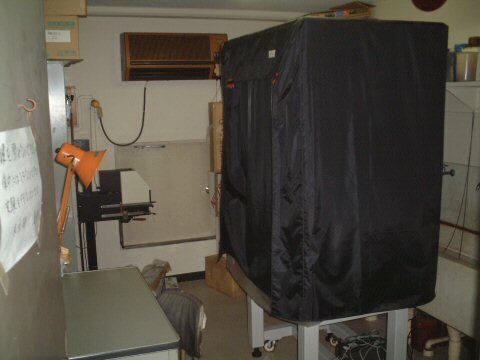 We have other darkroom for optical experiments. We, however, stoped to perchase MNRAS in 2002, PASP in 2005, A&A in 2012, AJ, ApJ, ApJS and ApJL in 2016.